PROACT-SCIPr-UK® – Positive Range of Options to Avoid Crisis and use Therapy – is a person – centred approach to support. 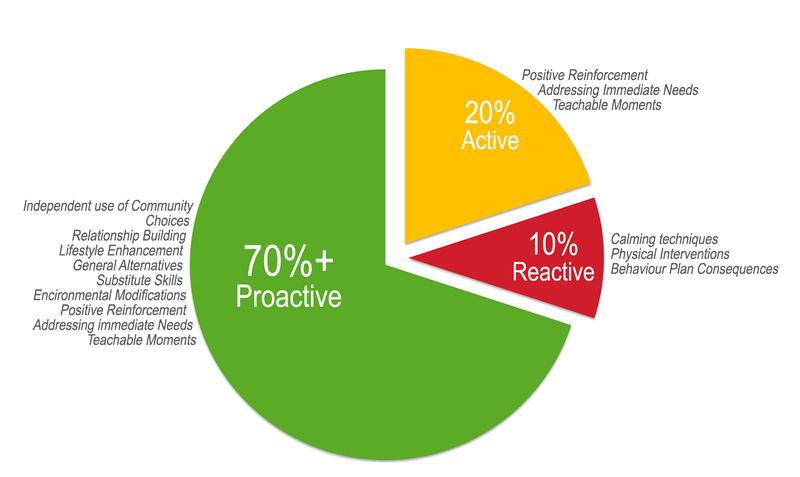 PROACT-SCIPr-UK® is a values-based approach with an emphasis on being proactive – getting it right for the person, rather than being reactive or responding to an episode of challenging behaviour. The aim is to raise the person’s self-esteem, improve quality of life, empower them and enable them to live a more independent and fulfilling lifestyle. The approach promotes a gradient model where the majority of the support we provide (at least 70%) is proactive, however it is acknowledged that from time to time people may require additional support to keep themselves and others safe. In order to ensure that this is addressed, additional more restrictive techniques are included within the overall approach to ensure that what is being offered has the capacity to cover a wide range of situations and minimise the risk of injury to both the care-giver and the individual. PROACT-SCIPr-UK® is unique in that it provides the opportunity to seamlessly blend current systems and approaches with the PROACT-SCIPr-UK® philosophy representing a ‘whole approach’. All our courses are based on a Training Needs Analysis / Audit of Need enabling us to provide a flexible solution which can be tailored to your needs. Training ranges from the more practical for Parents / Carers and Support Staff to Instructor Training for those who wish to be in-house trainers. Please see our Courses pages for further details.